The New York Knicks snap their 8-game losing streak in Staples Center against the Los Angeles Lakers 119-112. There were notable injury concerns for both teams before the game started as the Lakers were playing without their top two scorers, Lebron James and Kyle Kuzma. On the other hand, the Knicks were still without Mitchell Robinson, their rookie center whose absence has created a visible void in New York’s interior defense. This game was a must-win for the New York Knicks who were stumbling into a 3 game west coast road trip, nursing an NBA league-worst 8 game losing streak. The Knicks knew this win was essential because they were going into Los Angeles to face a Lakers team missing their top two scorers, who were 1-3, now 1-4, without King James this season. Trust me, nobody is more on “Team Tank” than me, but in that same breathe, it is important for the team to continue to develop and progress. A losing culture carries the risk of the coaching staff losing the locker room and the chemistry being deficient, which will negatively impact the future Knicks. This young team is desperate to not put their locker room in jeopardy while having their sites on the 2019 NBA Draft, Free Agency, and Kristaps Porzingis coming back. Enes Kanter deserves praise for his 4th quarter hustle and defense. Yes. You read that correctly. The disgruntled Center was making critical hustle plays to save the ball from out-of-bounds, was able to get to the free throw line when the Knicks offense was stagnant and tight in the 4th quarter, and was communicating on the pick and rolls and defended them well (Take that Devin Booker!). Mario Hezonja, another player who seems to live in the dog-house of the Knicks fan base and Coach staff, was essential for the team in the 4th quarter logging in 10 points, 2 rebounds, 1 block, 1 steal, and 1 assist, on 2-4 FG, 1-2 3PT, and 3-6FT in just 14 minutes. In Mario’s postgame on-court interview, Kanter ran on jumped on him in elation as Enes was running back to the locker room. Hezonja gave some short, but important, insight into the Knicks locker room alluding to the difference in chemistry when Kanter is energetic and happy like Enes was at the moment after the game, rather than how the disgruntled Center has been feeling (and expressing to the national media and social media). Luke Kornet, Noah Vonleh, Kevin Knox, Damyean Dotson, and Emmanuel Mudiay continue to prove to the Knicks staff that they belong in New York’s future. Fresh off a December rookie of the month, rookie Kevin Knox continues to dominate 1st quarters but slows down considerably as the game continues. The rookie admitted that his game still needs to be developed, but Knox has a nose for basket and a full off-season program with strength and conditioning will improve his overall game and especially his defense going forward. -Allonzo Trier, unfortunately, has not looked like himself since coming back from his injury and has seemingly hit the “rookie wall” this season. However, there is no need to worry about Trier, as he will come back into form with some more gameplay and consistent lineups. -Tim Hardaway Jr. put up 22 points but on 7 for 18 shooting, including 3-10 from three point land. The high volume, low percentage shots that Hardaway loves to take with 19 seconds left in the shot clock only hurt the Knicks. They stagnate the Knicks offense and create long turnovers and fast breaks for a poor transition-defensive team. Both Emmanuel Mudiay and Tim Hardaway are extremely hot and cold players (I refer to them as microwave players) that continue to put up volume shots for this young Knicks team. -Another DNP-Coach’s Decision for Courtney Lee and Lance Thomas. It is not difficult to understand why the Knicks have been inconsistent from game-to-game and even quarter-to-quarter. The February trade deadline is right around the corner and Head Coach David Fizdale still hasn’t set a rotation for the Knicks. This game was a perfect opportunity for young Frank Ntilikina to get a rhythm going against the Lakers swiss cheese defense, but the point guard unfortunately went down with an ankle strain and was seen in a boot after the game. 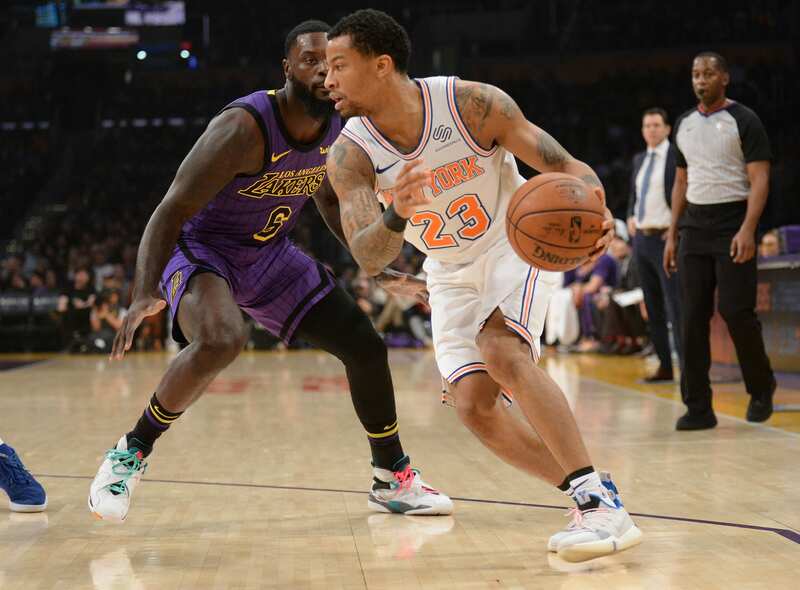 That is terrible news for Frank and his development, but good news for Trey Burke who stepped up against the Lakers in his absence to elevate the Knicks to their first win since November 25th. There is some optimism surrounding the New York Knicks following the win in Los Angeles. Rookie Center Mitchell Robinson, who has been nursing an ankle sprain, may be finally getting back to the court next game at the Portland TrailBlazers on January 7th. This will be a huge boost to the Knicks interior defense, but keep your eye on the addition to the rotation. Coach Fizdale has already admitted that it will be a demanding task to work in Robinson, Kanter, Vonleh, and Kornet into the lineup and keep them motivated. The next two games for the New York Knicks: @ Portland TrailBlazers on Monday January 7th & @ Golden State on Tuesday January 8th, to conclude their 3-game West Coast Trip.